These work with both iPhone and iPad. The web edition works with any PC or Mac. How does it work? Watch this quick video to see how it works. Why do you need a Password Manager App? I bet you have lots of passwords and keeping track of them can be difficult. Maybe you are keeping your passwords in a spreadsheet or written notebook that can easily be stolen. Or you may be keeping the same password on every website. If someone learns that password, they will have access to all of your secure websites. 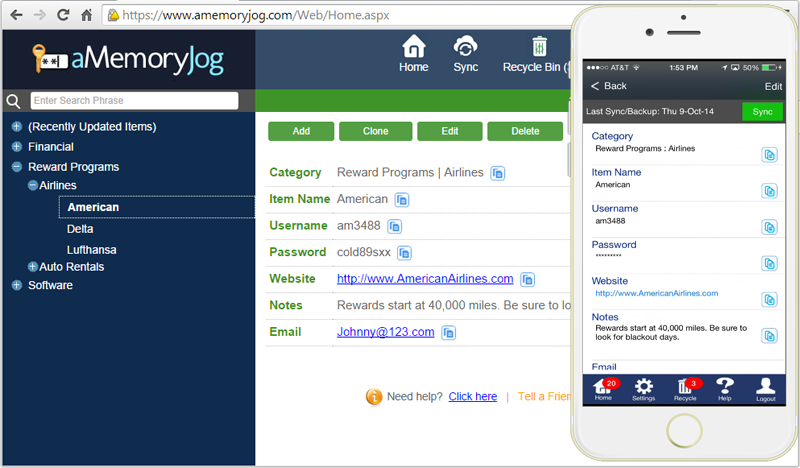 Using a password manager app like aMemoryJog safeguards your passwords with 256-bit encryption (like most banks). It stores the website address for each website userid / password you use and will auto-fill the stored userid and password when you go to that website. That way you can create really strong passwords for each website but not have to remember them. A while back, I was at the gym and left my iPad on a bench for a couple of minutes. When I returned, it was gone. For days I worried about someone logging into my secure websites and it made me think that there must be some way to protect them. Now that aMemoryJog is in the Apple App Store, can I kindly ask that you download the free edition here? Thanks so much for following my journey as I developed and release the app. Leave me a comment and let me know what you think about the app! This entry was posted in Cool Apps and tagged amemoryjog password management app, free password management app, reduced price on password management app on March 26, 2015 by Steve Miller.